Now-legendary, Crazy Domains was established in 2000. From humble beginnings, Crazy Domains has gone on to become a leading domain name registrar in Australia, Europe, India and the Middle East. Crazily good prices and Crazy deals, Crazy Domains is a place to call home for millions of customers and domains. We help startups, SMEs and larger established businesses go from good to legendary. Crazy Domains is operated by DreamScape Networks FZ-LLC, a part of the Dreamscape Networks Limited (ASX: DN8) group that employs hundreds of dedicated IT professionals globally within Technical Support, Customer Relations, Development, System and Network Engineers, and much more. Our offices, support, and data centres are networked around the world including Australia, Europe, Asia, India, New Zealand, the Middle East, as well as the United Kingdom and the United States. 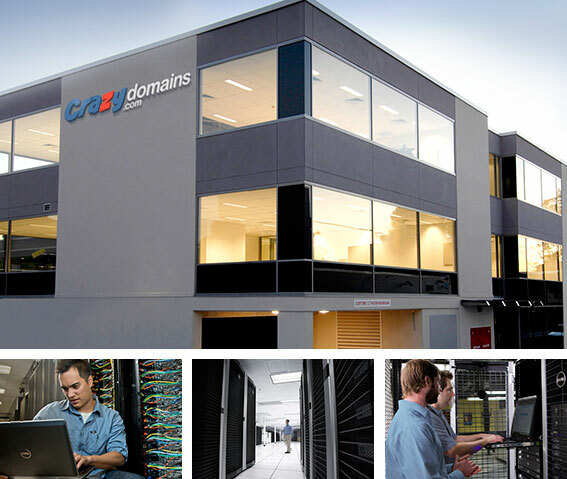 Crazy Domains uses high-performance systems and cutting edge technology to provide you with the best possible service. With data centres in all four corners of the globe, and servers located in tier-1 maximum-security data centres, Crazy Domains ensures the best in stability, maximum uptime and superior network speeds. We're here to make getting online with domains, web hosting, and email hosting crazy easy for you. Crazy Domains offers customer support over live chat as well as via email, telephone, and social media - and our experienced consultants and engineers resolve support tickets, on average, within 24 hours. Have a question? Need help? Don't be shy: connect with us today. As our name suggests, Crazy Domains is renowned for Crazy prices, coupled with leading online business solutions for business startups and established businesses. From domain registration, to web hosting, online marketing tools, site security and protection plus so much more. We have everything for your business to be successful online and the competitive edge you need - all at the very best prices. Check us out now: we won't be beaten!